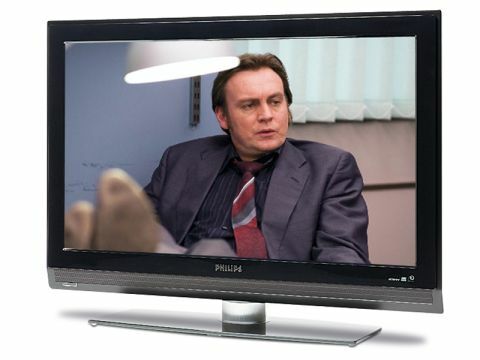 The Philips 37PFL5522D is the company's most 'affordable' 37in screen and, unsurprisingly, it lacks the aesthetic pyrotechnics of so many LCD TVs higher up the company's range, shorn as it is of any sort of Ambilight system or sculpting flourishes. It's essentially just a basic black rectangle. Connectivity pretty much lives up to the entry-level price. There are only two v1.2a HDMIs and no D-Sub PC input, meaning one of the precious HDMIs has to double up as a computer port. The 37PFL5522D sports 'merely' an HD Ready native resolution rather than a full HD one, though its claimed contrast ratio is a good-looking 7,500:1. However realistic this figure may or may not prove to be, it does at least reveal that the set features a dynamic backlight system like all of its LCD rivals. Perhaps the single most intriguing feature of the 37PFL5522D is its use of Pixel Plus HD processing, which boosted fine detailing in the last three or four generations, and is older than the latest Perfect Pixel Engine system, so you can't help but fear for its quality. And to some extent, those fears are justified by the 32PFL5522D's picture performance. What's immediately noticeable from the outset is how much motion blur there is over fast-moving objects. It's not so bad that pictures become unwatchable, but it can make viewing football uncomfortable and is certainly more of an issue than with any of its rivals. The Pixel Plus HD processing also fails to ramp up standard-definition sources to the screen's HD Ready resolution as successfully as we remember, leaving Freeview programmes looking rather noisy and soft by today's standards. It also tends to 'overcook' edges with HD and standard-def alike. The final let-downs find the viewing angle really quite limited, and colours don't look as vibrant as they do on any of the other models. Its black levels, though, are quite good. Also, fine HD detailing suddenly bursts into life to leave pictures looking exceptionally sharp and textured, at least until things start moving. And the set's colour toning with HD is generally quite enjoyable (though it drops off when watching standard definition). It's back to averageness with the Philips 37PFL5522D's audio, though, which features a very overcrowded mid-range that's over-run by a far-too-dominant, distorted bass element.